Living in the Beat Hotel in Paris and traveling around Europe in the 1960s, William Burroughs possessed the opportunity to rub elbows with several avant-garde circles active at the time. 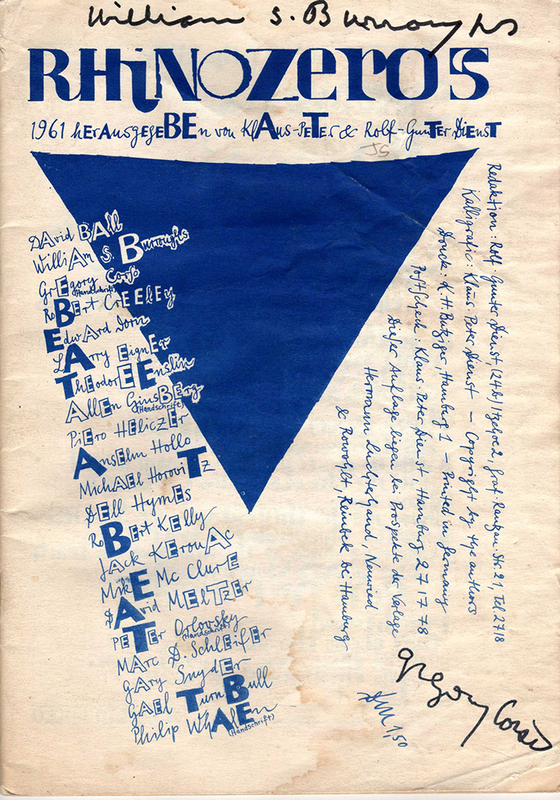 Previously, I wrote about Burroughs and his relationship with Scottish literary magazines. In 1961-1964, he also appeared in a handful of magazines in Germany and Belgium. I have always been curious about Burroughs’ appearance in three of these magazines: Rhinozeros, Nul and Phantomas. A little research shows Burroughs’ work tenuously linked to a few art movements that peaked in the 1960s. I have precious little information on these movements and magazines but I hope some readers, particularly European readers, might have some more information on these rarely discussed publications. 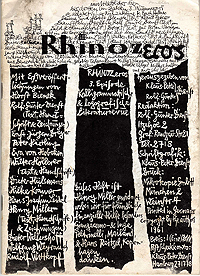 One of the more interesting magazines that featured Burroughs in the 1960s was Rhinozeros. Burroughs appeared in several issues of the magazine (Issues 5, 6, 7, 9) from 1961-1964. Burroughs submitted “Wind Hand Caught in the Door,” “Novia Express,” “Be Cheerful, Sir Our Revels Touching Circumstance,” and “Text.” Pieces from the then-titled Novia Express trickled into various magazines at the time, like Second Coming Magazine and Evergreen Review. “Wind Hand Caught in the Door” came from the end of Soft Machine which was published by Olympia Press in 1961. The other pieces are cut-ups that I do not think appeared elsewhere. “Text” contains a fragment from the Edinburgh Conference along with a fold in of Burroughs’ writing with Finnegan’s Wake. 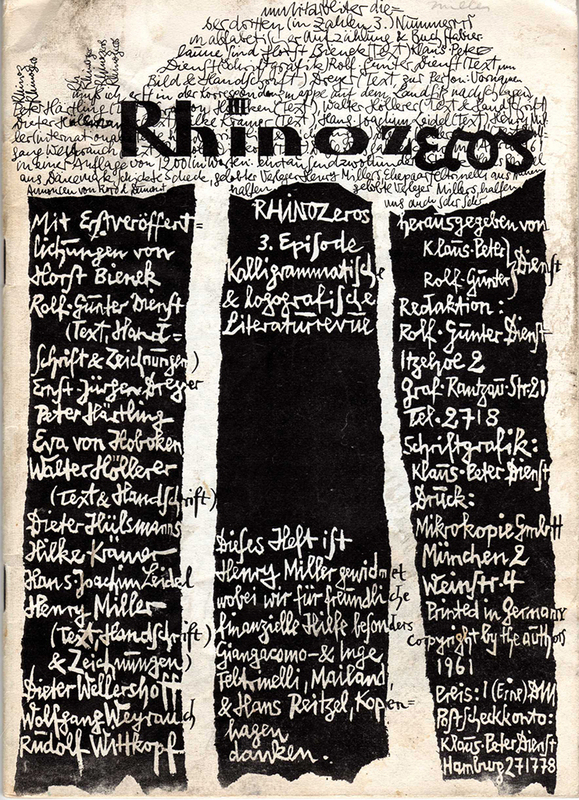 Rhinozeros featured concrete poetry and is a typographic marvel. 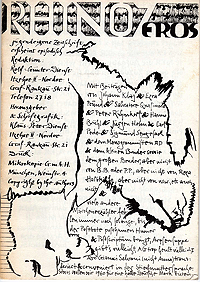 Several of the texts appear in the authors’ own handwriting in colored ink. Text appears in both English and German. These magazines really have to be seen to be believed. The presentation of the pieces is extraordinary and in fact is difficult to read even in English. I have written previously on the similarities between Burroughs’ cut-up texts and concrete poetry. Like Cleft in Scotland, the editors of Rhinozeros were interested in Burroughs’ work of the period. 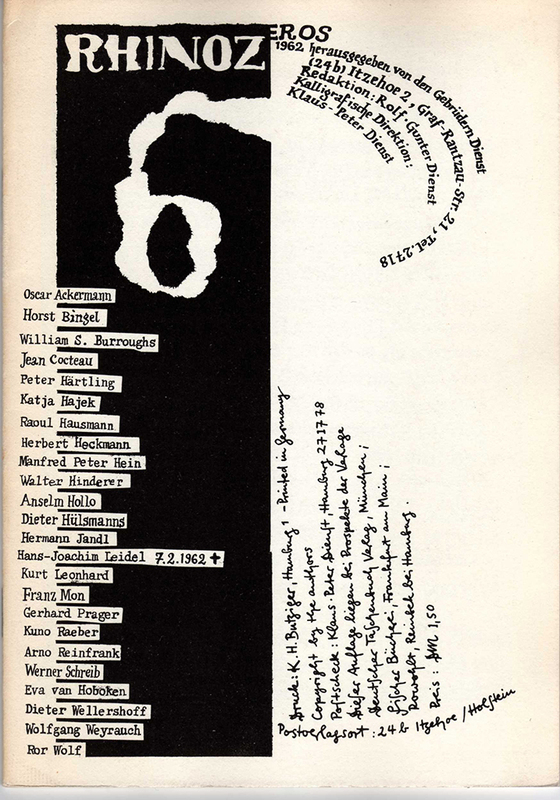 Port of Entry: William Burroughs and the Arts provides a picture of Burroughs’ piece in Rhinozeros 5 as an example of visual poetry in the long tradition of Mallarme, Apollinaire, and the Dadaists up to the concrete poetry of the 1960s. 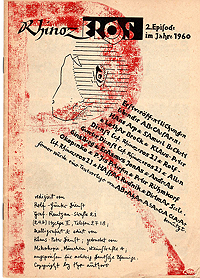 The seeds of Burroughs’ magazine appearances in a Belgian magazine were also sown in Germany. 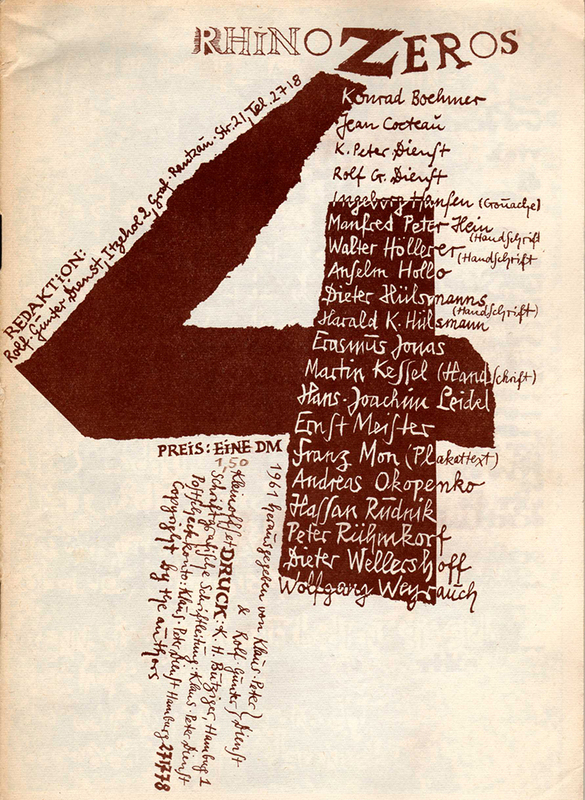 Founded in DÃ¼sseldorf, Group Zero (1958-66) helped create an experimental art scene in the postwar era. 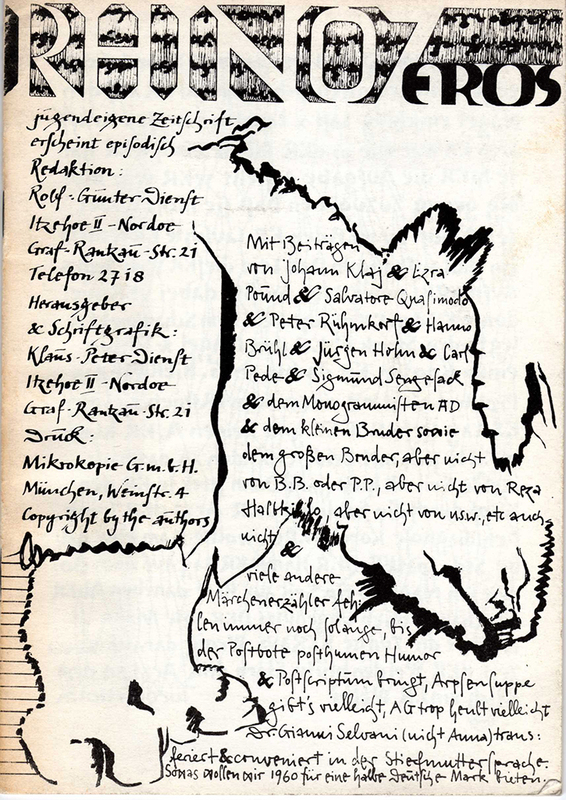 Members Otto Piene and Heinz Mack (later joined by Gunther Uecker) held one-night exhibitions in their studios and published a journal. They created monochrome paintings and works utilizing light and movement. (See this slide show for examples of Group Zero works.) They chose the name Zero because it had no nationalist associations and evoked a blank slate, the potential for a new beginning. In Belgium, Burroughs appeared in several issues of Nul Magazine. My initial impression was that this magazine served as the sounding board for the Nul Movement. Henk Peeters was a charter member of Nul which was the Dutch version of the German Zero movement of the 1960s. Most Nul artists rejected expressionism, and they often focused on systematic variation in works that could look like “hand wrought Minimalism.” In 1958, Peeters founded the Dutch “Informal Group.” “The Informal Art essentially was a result of the Post War abstract expressionism and the Informal artists strived for the dissolution of recognizable form in matter. ‘In-formal’ literally meant: without form.” Around 1960 everywhere in Europe young artists longed for impersonal, ‘objective’ art and the key figures in this movement were Lucio Fontana, Yves Klein and Piero Manzoni. Peeters had seen the exhibitions of monochrome paintings by Klein in Paris and through Klein he came to know the Zeroists. They chose the name Nul after the German Zero group. The art work of the Zero Movement shows little similarity with the art of Burroughs in the 1960s cut-ups and scrapbooks or even the later art of the 1980s and 1990s. Burroughs’ work of the 1960s remains rooted in collage and fixated on the written word. The later fully abstract art work, like some of Kerouac’s painting from 1959-1960, contains elements of abstract expressionism in its De Kooning-like brushstroke. The paintings are gestural in the application of paint to the surface with individual strokes very defined. In many works, Burroughs concentrates on the representation of a figure. This is at odds with the Zero Movement’s attempts to rid paintings of “recognizable form.” Paintings in the work pictured above seem like minimalist art with roots in abstract expressionism although in this case the work of Barrett Newman or Ad Reinhardt. Burroughs’ affinity with Zero/Nul is less in a comparison of artwork but in a similarity in goals and maybe theoretical underpinnings. Zero/Nul sought a detached, anonymous art, with which they turned away from the extreme individualism of other Continental art movements. They wanted to get rid of the idea of the painting as a representation of three-dimensional reality on a flat surface. The objective of ZERO/Nul was to reduce the figurative; they wanted to show the essence of reality by means of the reality of matter. The color white was one of the most important tools for this, together with the elements light, air and water and modern technologies. The artist accepted things “as they were” and avoided all personal feelings. Zero/Nul strove to take painting back to its essence. These efforts parallel Burroughs’s work with the novel and the cut-up. Zero/Nul sought silence in art as Burroughs searched for it with the written word. To some extent in Naked Lunch and more radically in The Soft Machine, The Ticket That Exploded and Nova Express, Burroughs abandoned the traditional form of the novel, such as plot, character development, and linear narrative. Burroughs would experiment more radically with these features in the cut-up texts that appeared in magazines throughout the 1960s. Features such as the death of the authorial intention (as exemplified by Burroughs’ distancing himself as author by not remembering writing Naked Lunch) and the use of objective tone in Burroughs’ novels, like Junkie, correspond with Zero/Nul’s desire for an impersonal art. Literary theories, such as deconstruction and structuralism, come into play dovetailing with Burroughsian theories of the word as image, the word’s relationship to speech, and the word’s link to the referred object. These similarities seem stretched. Surprisingly, Nul published, not cut-up-based material, but the less textually radical routine based pieces, like “Roosevelt after Inauguration.” Nul also featured a piece entitled “Take That Business to Walgreens.” This has me wondering if Nul Magazine was associated with the Nul Movement. The magazine was published in Belgium by Paradox Press. I can find next to nothing on Nul Magazine. 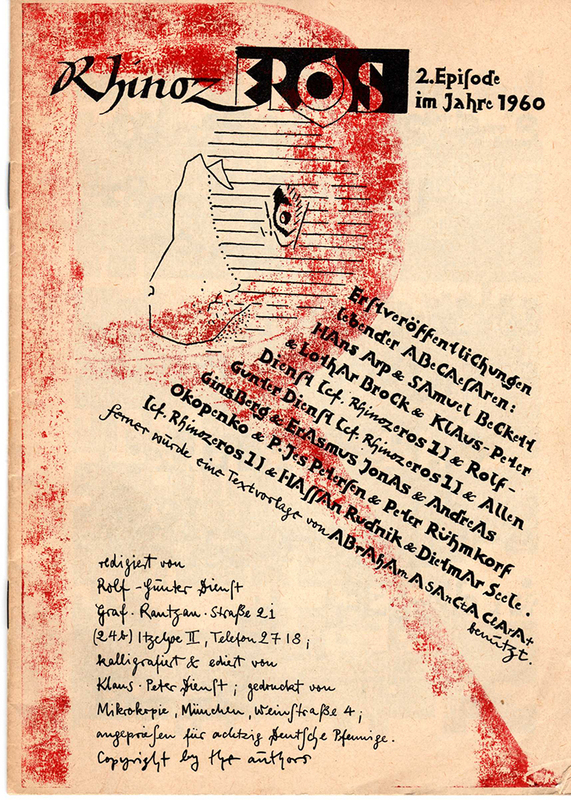 Why exactly was Burroughs published in two separate issues of this Belgian/Dutch magazine that may or may not be associated with an avant-garde art movement? Any help would be appreciated. 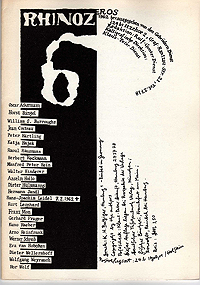 Burroughs also appeared briefly with Brion Gysin in an issue of the Belgian magazine Phantomas. Burroughs provided a quote to a larger Gysin piece. I believe Phantomas was the vehicle of the Phantomas Group. Progressing from the work of Belgian surrealists like Rene Magritte, groups like Phantomas challenged and broadened the scope and meaning of Surrealism. The ultimate Surrealist act is no longer the gratuitous act, but the act of fragmentation and deconstruction. The goal is to negate oneself. This dovetails nicely with Burroughs’ theories of the controlling nature of the Word and the need to combat its tyranny with silence. The cut-up also parallels Phantomas’s interests in fragmentation of self and thought. Gysin’s early ties with the Surrealists in the 1940s are probably more relevant here as are his permutation poems in The Exterminator and Minutes to Go. Upon closer examination Burroughs’ ties to the avant-garde in German and Belgian magazines seems to be less strong and substantial than in Scotland. Yet Burroughs’ work with the cut-up dovetailed with the theories championed by the Zero, Nul and Phantomas Movements. Possibly a reader with more knowledge of those movements can clarify exactly what Burroughs was doing in these rarely discussed magazines from 1961-1964. 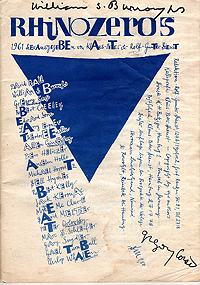 In addition, more information on Burroughs’ publication history in Germany and Rhinozeros’ role, if any, in introducing Germany to the work of the Beats would be appreciated. Written by Jed Birmingham and published by RealityStudio on 27 June 2006. Karl-Otto Paetel was a Weimar National Revolutionary (does not eyactly = Nazi) and an interesting person.